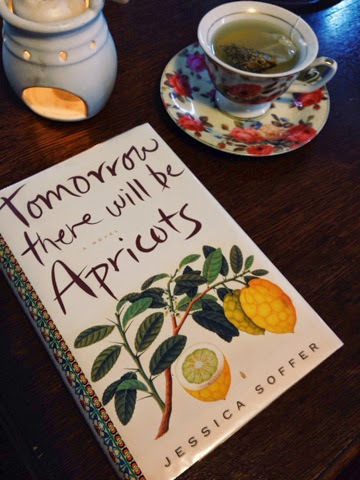 Tomorrow There Will Be Apricots - by Jessica Soffer. For the second time in my life I chose a book at random with my first name on it. The first time was at the Vancouver Library when I was 19, and it was called Jessica - by Bryce Courtenay. Side note: That's when my love affair with Bryce began, as did my love of Australia and Australian fiction. He is still my most favourite author to-date. So two for two, based on random pickings with my name on them isn't bad, eh? Meet teenage girl Lorca. She is lonely, creative, responsible, an old soul. But she aches to be enough for her self-obsessed mother. To have her mother's love and acceptance would be everything. I loved this girl from the beginning. We've all been there; wanted to be someone to somebody. The author puts you right in the character's shoes, which is where I want to be when I am reading a story. She had me aching for Lorca to be loved. My teen years are a poignant reminder of this so for me it was very easy to identify with this character. I wanted to be enough for my own mother and father; I thought there was a void only their love could fill. You just want to tell this girl she's already everything she needs to be and more. A truth I now know. The book follows Lorca on her search to find Masgouf, a recipe her Chef mother says is her favorite. If she can just find out how to make this meal for her mother she will finally be loved; however, deep down she knows the truth, she won't ever get it. Along her journey she meets Blot. Every teen girl needs a crush, right? And more importantly a true friend. Together they track down an elderly woman, named Victoria, who widens the story line and the door to Iraqi food. Jessica Soffer describes a meal in a way that makes each morsel jump off the page into your mouth. WHAT? My love of books and food combined, yay. Mmmmm. Lorca finds in Victoria what she's craved so much from her own mother, and the possibility of more than that ( but I won't spoil it). By the end of this book Lorca does realise that she can survive with out her mother's love by making family out of friends. Hey, I did that too. Dysfunction forces you to make your own family. Out of grief can spring great joy. I loved how this book brings total strangers together in moments that will change them forever. There is such a warmth to these pages. You can really feel the sense of loss, and desire for acceptance. I had a hard time putting this book down because the images and characters Jessica Soffer painted came to life. That's why my husband never has time for "fun" book reading. Always the next semester.